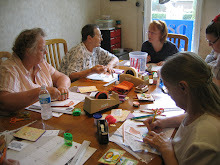 The pictures of the projects for the classes for Cootie Coo Craziness 2012, October 19-22, 2012, will start appearing on Tuesday, September 4. The entire schedule will be posted by Saturday, September 8. Thank you for your interest in this fantastic event! !